Some OpaVote customers hold an election using paper ballots and need to enter the ballots into the OpaVote website. We provide a ballot editor (pictured here) to make it easy to do this, and in this blog post we provide some tips to make this process efficient and prevent errors in ballot entry. Once you have all of your completed ballots, the first thing you should do is number them. For example, put them in a pile, and write 1 on the top-right corner of the first ballot, 2 on the next one, and so forth. This makes it much easier to verify that the ballots were entered correctly. If you have a relatively small election, one person may create an OpaVote Count and enter all of the ballots using our ballot editor. The same person or a different person should then verify that the ballots correctly. To verify the ballots, click "View Ballots" from the Count and a new window will open up that shows the ballots, and these ballots will be numbered in the order of entry and should match the numbers that you wrote on the ballots. The person verifying the ballots should check that each paper ballot is an exact match to each ballot as displayed by OpaVote. Alternatively, you could have two people each enter all of the ballots. You could save the ballots entered by the first person as ballots1.txt, save the ballots entered by the second person as ballots2.txt, and then compare the two files to make sure they are an exact match. You can use a website like DiffChecker to see if the two files are identical. The process for larger elections is the same except that you may want to divide the ballot entry among multiple people to make it faster. Note that our ballot editor only allows you to edit up to 1000 ballots at a time so if you have more than 1000 ballots you will need to do it in smaller chunks as we describe here. As an example, let's say that you have 2000 ballots, and you would like to divide them into 4 groups of 500 for four people to enter in parallel. Number all of the ballots as described above, and then give the first person ballots 1-500, the second person ballots 501-1000, and so forth. Each person will create an OpaVote count, enter his or her portion of the ballots, and then verify them as described above. 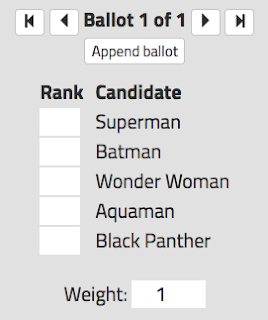 Each person will then download the ballots to a file and give the ballots an appropriate name, such as ballots1-500.txt. Note that there is no cost to enter ballots so there are no extra charges for having multiple people enter ballots (payment is required only when counting ballots). After each person does this, you will have four ballot files. Using the processes described here allows you to enter ballots quickly and also ensures that they will be entered correctly.